In looking around online to see what other versions of Penuche call for, I’ve found that it or something very similar to it has a million names – Tablet in Scotland, Sucre à la Crème in Quebec, Russian Fudge in New Zealand and Australia, Panoche in Hawaii and the Southern USA – but the recipe that was shown to me, scribbled on a piece of paper, called it Penuche. Every year on Christmas Eve, for as long as I can remember, we’ve gone to my Aunt Wendy’s house for dinner. When I was a kid, it was a madhouse – a million kids and adults, overhead, underfoot, out on the lake playing shinny. Dinner was massive, and delicious, and a noisy riot. Later it was smaller, just adults, quieter and mostly my mom & aunt’s side of the family. After dinner we would bundle in the car and drive up the road to Nana and Papa’s, where there was always tea, and we’d open the presents from them and our other aunts and uncles. On the way home, we’d honk as we exited the driveway and drove down Frank Hill Road into the crisp night, Nana waving from her kitchen door. One of us would point to the sky and say ‘Do you see Santa?’ while others would claim to hear sleigh bells. Nana died in 2012, and my Aunt’s health has declined, which meant a lot of changes to the Christmas Eve tradition; when you get older, you always have to adjust. You have to make your own traditions to replace the ones that can’t continue. This recipe, for a brown sugar fudge that a friend of my aunt’s would give her as a gift every year, came to me scribbled on a piece of paper that I took a quick photo of a few years ago. Until this year, I’d never tried to make it, but I recently realized that if I didn’t make it myself, I might never have it again. It took two attempts – candy is not my forte – but the second time I got it to work. If you follow the instructions below, you should find it works too – the initial instructions I was working with were a bit vague. Grease pan; line with plastic wrap, and set aside. Combine all ingredients except vanilla in a large saucepan and cook at medium heat, stirring constantly. 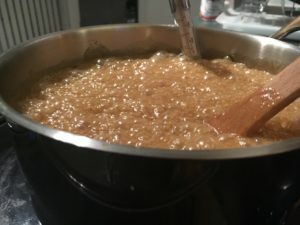 Mixture will double in size when it boils. Bring to a boil; reduce heat to medium, simmering until mixture reaches 238 F (soft ball stage – see note below); this should take 20-30 minutes. Stir frequently. Keep it at as low a temperature as you can while continuing a simmer. Remove from heat. Give it 5-10 minutes to cool, than stir in vanilla. Beat mixture(electric beater or a wooden spoon, whatever you’ve got) until it is thickened , smooth, and it loses some of its gloss, 5-10 minutes. Pour immediately into greased pan. Using a rubber spatula, quickly smooth out the mixture to have an even surface( as it cools, it hardens, so work very fast). Do not scrape the sides of the saucepan, as they will cool and harden quickly. Refrigerate, uncovered, for about 20-30 minutes, until firm. 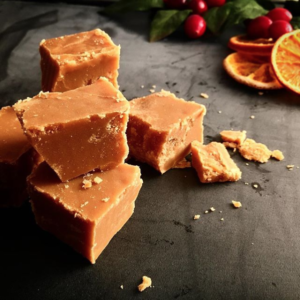 Run a sharp knife under hot water; wipe off, and use a firm downward motion to slice fudge. Run under hot water and wipe clean between each slice. Do not use a sawing motion when cutting – it’ll just disintegrate. : this is a point in candy-making where, when you’ve heated the mixture to the appropriate temperature, a drop of the mixture dropped into cold water will form a soft ball. 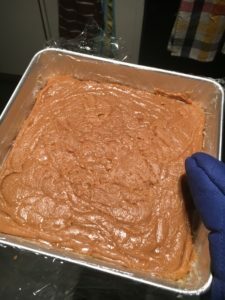 If you don’t have a candy thermometer, you can use this to judge whether or not your fudge is at the correct temperature. But really, candy thermometers aren’t expensive and they’re more accurate, so it’s worthwhile to buy one if you can. 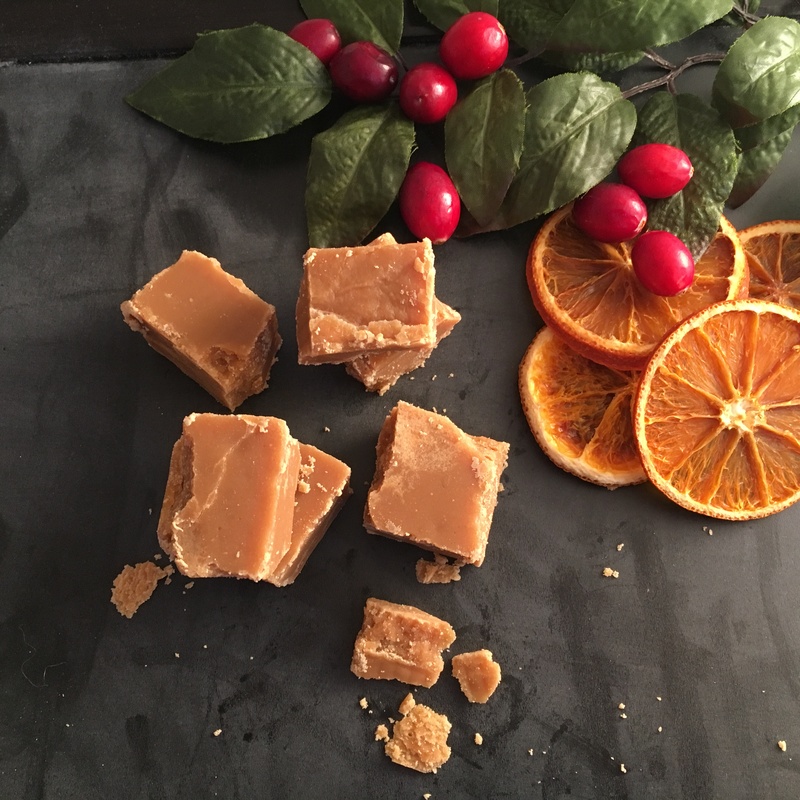 Would this be the same recipe my grandma Shaw used? She always made us fudge like this when we were visiting her. 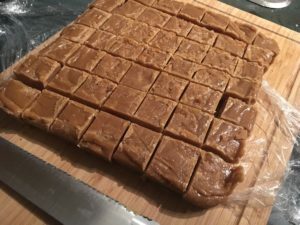 That would have been before my time, and my version of this recipe is from my mom’s side of the family, but it probably is the same or very similar! I wonder if anyone has any of great-grandma Shaw’s recipes?